The Chicken Wagon is the latest and greatest model in our current range, and the design takes its inspiration from the famous covered wagons of the American ‘Wild West’. The Poultry Club of Great Britain Guidelines indicate that this house would be suitable for up to 7 large fowl or 17 bantams. However, we recommend a little more space per bird, and suggest that it is ideal for up to 6 larger birds or 12 bantams. It has two individual nest boxes, each with a roll-away nest box insert, which helps keep eggs clean. Once laid, they roll backwards into a collecting area which is covered by a flap. Easy access to the collecting area is provided by a lockable sliding cover at the rear of the house. The nest boxes can be easily removed, if required. Access to inspect the birds and for cleaning is via a full-height front door which can be quickly opened, yet securely fastened in just a few seconds. Easy access makes regular cleaning a breeze. Permanent ventilation is provided under the roof at the front, with two additional fully adjustable circular vents at the back, so the house remains surprisingly cool, even in strong, direct summer sunlight. Being plastic, the Wagon requires no routine maintenance. There are few crevices for pests (such as red mite) to hide in, and the house can be thoroughly cleaned very easily – in seconds if you have a pressure washer. And it will dry out very quickly, too. This house can be easily moved by one person, and its large wheels means that it won’t sink into the ground. If you ever need to dismantle your Chicken Wagon for any reason, you can easily do so and then rebuild it just as easily. Your wagon will not be damaged by this process. The Chicken Loft Medium is made from recycled plastic and will hold a maximum of 11 large fowl or 22 bantams. It has 3 removable perches. 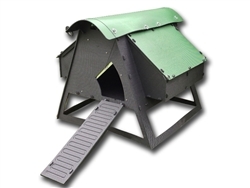 The Chicken Loft Small is made from recycled plastic and is suitable for a maximum of 8 large fowl or 15 bantams. It has two single nest boxes and two removable perches. The door is designed so that it won’t trap dirt in the door slots, and it can be easily opened and closed, either manually or with a Chickenguard auto-opener. Access to inspect the birds can be gained via a full width back door which detaches using quick release pins. When the door is removed, there is no ‘lip’ on the floor edge. This, and the fact that the roof removes in seconds as well, makes regular cleaning a breeze. Access to the nesting box is quick and easy – just remove two quick release pins and lift off the lid. The entire nest box can be completely removed for cleaning by undoing more quick release pins. Permanent ventilation is provided under the roof, and it also has a fully adjustable circular vent. Even though the sides are made from black plastic, the house remains surprisingly cool, even in strong, direct summer sunlight. The Large Chicken House is made from recycled plastic and will hold a maximum of 8 large fowl or 15 bantams. It has 2 nest boxes and 2 removable perches. The Medium Chicken House will hold a maximum of 5 large fowl or 9 bantams. It has 2 nest boxes and 2 removable perches. The Small Chicken House is suitable for a maximum of 3 large fowl or 4 bantams. It has a single nest box and one removable perch. The door is designed so that it won’t trap dirt in the door slots, and it can be easily opened and closed. Access to inspect the birds can be gained via a full width back door which detaches using quick release pins. When the door is removed, there is no ‘lip’ on the floor edge. This, and the fact that the roof removes in seconds as well, makes regular cleaning a breeze. Access to the nesting box is quick and easy – just remove two quick release pins. And the nest box lid can be completely removed for cleaning by undoing two more quick release pins. Being plastic, the houses require no maintenance. There are few crevices for pests (such as red mite) to hide in, and the house can be thoroughly cleaned very easily – in seconds if you have a pressure washer. And it will dry out very quickly, too. Carry handles are cut into the roof, so it is easy to move. But, even if you need to dismantle your hen house for any reason, perhaps because you are moving house for example, you can easily do so and then rebuild it just as easily. Your hen house will not be damaged by this process. 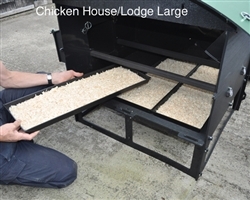 The Large Chicken Lodge is made from recycled plastic and will hold a maximum of 8 large fowl or 15 bantams. It has 2 removable perches. It is identical to the Chicken House, except that it has integral legs that raise it off the ground. The Medium Chicken Lodge will house a maximum of 5 large fowl or 9 bantams. It has a double nest box and two removable perches. The Small Chicken Lodge will house 3 large fowl or 4 bantams. It has a single nest box and one removable perch. An optional Extra - these droppings trays make cleaning out even easier! Large House or Lodge you will need 3 trays.